What does overnight fame do to you? Please note this review contains spoilers. An ordinary 13 year old Celeste (Raffey Cassidy) survives a 1999 Staten Island school shooting. To process her grief, shy Celeste composes a song with her sister (Stacy Martin) which rockets her to stardom. Fast forward eighteen years later, Celeste (played by Natalie Portman) is a 31 year old attempting to launch her comeback with her 6th album. But it isn't without drama as terrorists dressed like her in music videos carry out a mass shooting bringing Celeste back to how it all began. Director/writer Brady Corbet mixes raw emotional confrontations, stylised music videos, concerts complete with backup dancers and a chanting cult following. This film will have you pondering about Vox Lux, as it's disorientating with no real plot. Willem Dafoe provides structure as he narrates the life and times of Celeste providing commentary giving the film a sense of impending doom. Dafoe tells the story of Celeste, a teenaged girl who survives a tragic school shooting (you'll be gasping at the terrifying first scene) and sings an original song which is captured by news cameras which touches the hearts of the public catapulting her into pop stardom. Celeste is snatched up a self-absorbed manager (Jude Law) and a record label executive (Jennifer Ehle), who look at her and see dollar signs. Celeste's older sister Eleanor tries to protect her 14 year old sister from the harsh realities of the music industry. The film picks up again 16 years later where Celeste is a mess, the drugs and alcohol have taken a toll but she's ready to make a comeback. Set on the first day of the new tour at her hometown, Celeste and her team manage a crisis as there has been another mass shooting in Europe with the killers wearing masks from Celeste's first music video many years ago. The film focusses on Celeste and through Dafoe's voiceovers we learn of her part in life, "In the year 2017, Celeste would be 31 years old, prisoner of a gaudy and unliveable present which had reached an extreme of its cycle—and there was no imagining what forms it, or she, may assume." The voiceovers keep reappearing adding social and political commentary after Celeste delivers a bizarre answer at a press conference, "Celeste had been led here by example, making loose proclamations akin to those made in vogue by the government officials and public representatives of her era. She was frightened and wanted to hide." In the melodic voiceover tones of Dafoe, living in this modern era, being a celebrity means news will never stop as long as the headlines can focus on them. 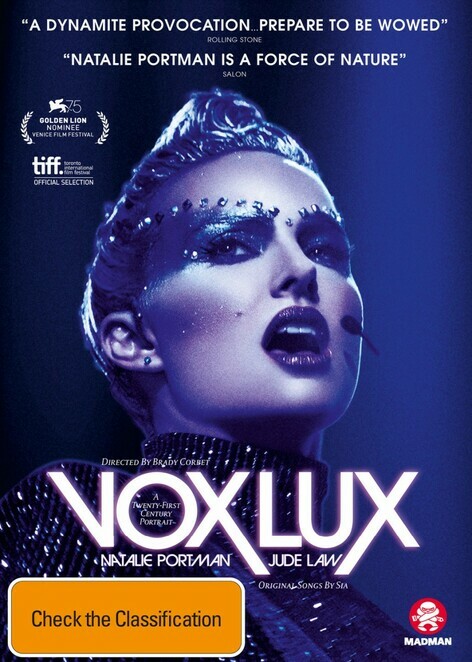 Vox Lux gives a sense of what overnight fame does to those who experience it, how time seems to speed up and fall away. Sia's original songs and music from Vox Lux have a hypnotic quality with quite a statement. The film is sometimes profound, silly, riveting and emotional, and will leave you thinking.